… for those who want to buy me presents. 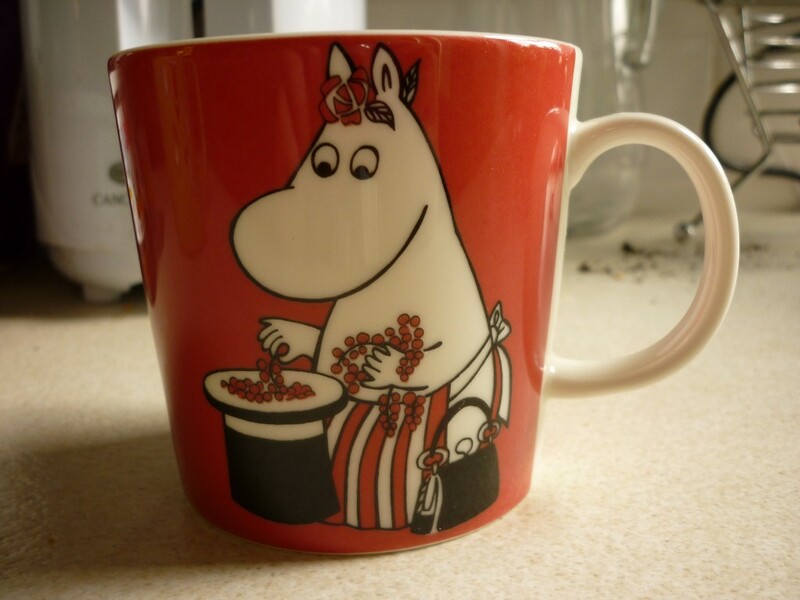 Last weekend I went to Finland and saw Moomin mugs in the shops. I decided to start collecting them. As of right now, I own two. The one pictured which I bought last weekend and one that’s somewhere in storage at my mom’s. I can’t even remember which one it is. I think it’s blue? I got it years ago from my uncle. So! If you’re wanting to buy me a present but have no idea what to get me? A Moomin mug would certainly be appreciated. Or then there’s always my Amazon wishlist. Or various knitting related items that I’ve got my eye on. So yes, I went to Finland last weekend. I was over there for four days. Renewed my passport, bought the mug, my youngest sister got confirmed, met up with a Belgian friend who I hadn’t seen for almost three years, went swimming. Good times were had. What I did forget about were the mosquitoes. And how tasty I am to them. I came home with seven really itchy bites. But still glad I went. Knitting wise, the Lissajous are still on the needles. I’ve decided to keep them as just lunch hour knitting since I don’t have anything else that’s easily portable to work on. The last few days I’ve been trying to decide what my next project will be and that’s proven to be difficult. Last night I was thinking about sweaters. Today I was looking at lace shawls. I think I’ve chosen my yarn and pattern, but I’m not going to say what it is until I’ve actually cast on. I’ve also started spinning with my new drop spindle. It’s a real challenge for me to spin thicker yarn that’s consistent now. I’ve gotten pretty good at getting really thin yarn on my old drop spindle, but thicker? I have to concentrate on that. But at least it’s going pretty quickly. Already over halfway through the 100g I’ve got (using SW English Wool Blend from Wildcraft Fibres in the Pudding colorway). So while I’ve been thinking about my next project, I’ve been making more squares. I have a feeling this blanket’ll take at least another year, maybe two, to complete. But that’s okay, since it is for me, so there is no deadline for it. It’ll be ugliest thing ever (I’ve dubbed it FrankenBlanket), but at the same time, I’m pretty sure I’ll love it.